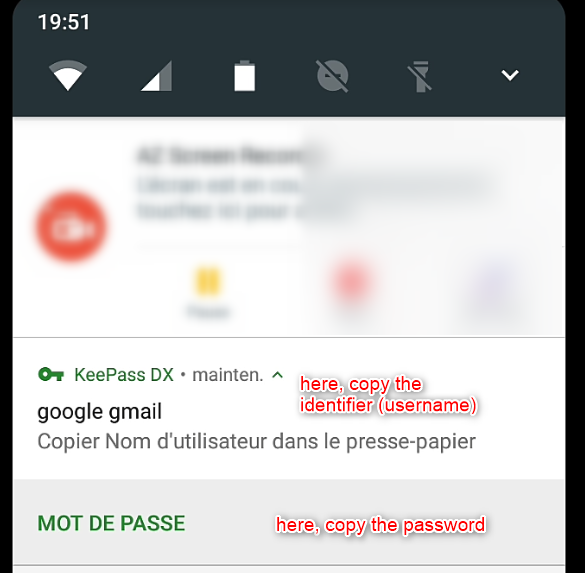 In the Android version, Keepass DX and Keepass2Android applications, after unlocking the database, you can copy the user name and password. 3. we reduce the application . 4. then we see appear in the notification bar, a KeepassDX notification divided in two, with the ability to copy the username and password . 5. click on it to copy the username and password. The notification disappears after clicking on it. I would love to have this feature in Enpass, Android version. There is a very embarrassing disadvantage, with some websites when you reduce the web browser , because go to copy the password or username since Enpass, then when you switch to the browser window, the input fields are now cleared.